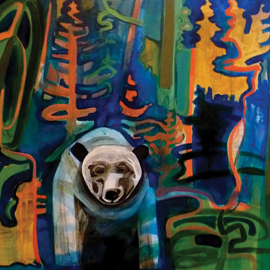 BRANTFORD – The latest exhibition at Wilfrid Laurier University’s The Yellow Brick Wall gallery features an exhibit titled Spirit Bear. The exhibit runs from Nov. 1 to Dec. 15. The artist behind Spirit Bear is Jessie Buchanan, a First Nations acrylic painter with Ojibway roots. Her paintings are an attempt to capture the ineffable quality of spirit (manitouwabi in Ojibway), which can be perceived in all things. It is a spiritual connection to the land that drives her work. “My goal is to convey what I consider to be transcendent aspects of ‘ordinary’ experience through colour and form in order to inspire others,” said Buchanan. “I include Ojibway words in naming my paintings because they seem to further empathize and bridge the First Nations spiritual aspects in my work. The Yellow Brick Wall is a new and exciting exhibition venue at the Brantford campus of Wilfrid Laurier University. Designed to provide appreciation and enjoyment of Canadian art to members of the Laurier community and beyond, The Yellow Brick Wall aims to contribute to the growth of Laurier students, encourage dialogue and reflect the diversity and culture in our community.